Not everyone is happy about this. Buena Vista and Salida have birthed a protest movement that has been more noisy than effective. By some estimates, 80 percent of the roughly 17,000 people in Chaffee County are opposed to this diversion of water. Still, when it came time to issue permits, the three-member Board of County Commissioners was unanimous in approving Nestle’s plans. In the end, it was probably a combination of fear and Old-West style property rights values that carried the day for Nestle. Nestle is paying Aurora $160,000 a year for the water. The amount paid increases 5 percent a year for the first 10 years of the lease. After 10 years, Nestle has the option of requesting a second 10-year term. If Aurora agrees, the price will increase 3 percent a year for the final 10 years. Nestle can break the agreement at any time. Aurora can only break the deal if it can demonstrate that it needs the water for its own uses. The Aurora City Council voted 7 to 4 to approve this deal last year. 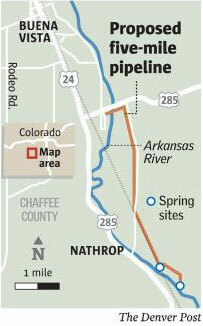 More Nestlé Waters North America’s Chaffee County Project coverage here and here.